The 2016 Work Programme Symposium will take place from 2 to 4 May 2016 in the WMO building, Geneva Switzerland. to discuss and provide recommendations on the content of the GEO 2017-19 Work. The Symposium will also allow the recently appointed Programme Board to have a rather complete overview of the GEO activities and to interact with the GEO Community. The Programme Board will meet just after the Symposium, on 5-6 May. Energy and Mineral Resources Management. Food Security and Sustainable Agriculture. 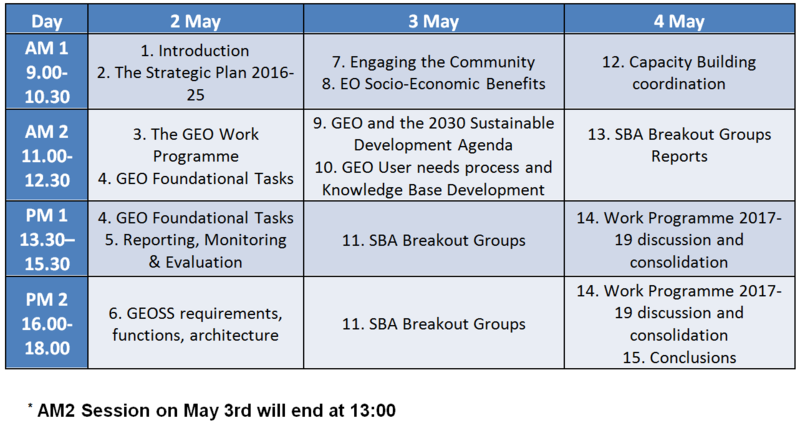 The online registration for the GEO 2016 Work Programme Symposium is available here. Please make sure to register before the meeting. In parallel to the GEO Work Programme Symposium, the “GIS for a Sustainable World Conference” will be held from 2-4 May at Campus Biotech, jointly organized by UNITAR/UNOSAT, ESRI and GEO. Campus Biotech is within walking distance from the WMO Building where the GEO Work Programme Symposium will take place. Work Programme Symposium participants are kindly invited to attend the Conference reception on Monday 2 May, from 18.00 to 19.00. If you plan to attend, please register here. Panel: Closing observational gaps and improving access to GEOSS resources. Panel: Xingfa Gu, China (presentation), Angelica Gutierrez-Magness,	AmeriGEOSS (presentation), Deon Terblanche,	WMO, Monica Miguel-Lago, EARSC (presentation). The panel will cover a broad spectrum of different GEO stakeholders’ perspective. Identify the key objectives for each SBA in the medium and long term (addressing involvement of specific communities/Institutions, user needs/policies to address, development of new methodologies /applications, cross-cutting role of Climate/Weather , …….). This initial set of objectives should develop into a consolidated SBA’s scenarios and roadmaps that will serve as a reference for GEO Members and PO’s to plan and implement future actions. Provide recommendations on activities to be included in the 2017-2019 GEO Work Programme, as a result of the discussion on activities currently included in the 2016 Work Programme + new ideas. Discuss and provide initial recommendations on how to structure dedicated SBA community (ies) as a permanent consultation forum and major actor for the implementation of the SBA User needs process and the GEO knowledge base development, described in the foundational tasks GD-08 and GD-09 respectively. The sessions will include, as necessary, presentations of GEO Community Activities, Initiatives and Flagships; for initiatives and flagships, their consistency with the criteria defined in the Strategic Plan Reference Document should be highlighted, with a focus on user involvement, planning and deliverables, allocated resources.